As I look back on the past month, I find myself returning time and again to the idea of leadership and the many different forms it can take through philanthropy. Whether funders provide essential safety net services, equip and encourage our next generation of changemakers, or have challenging conversations around equity and impactful giving, SCG members are on the forefront of social change in our region. I invite you to take a moment and look back with me at just a few of the individuals and initiatives from the SCG community that exemplify our leadership values. Please continue reading below for a recap of exciting news from our membership. You can also check our News Page or visit us on Twitter and Facebook for the latest updates on SCG and philanthropy in Southern California. 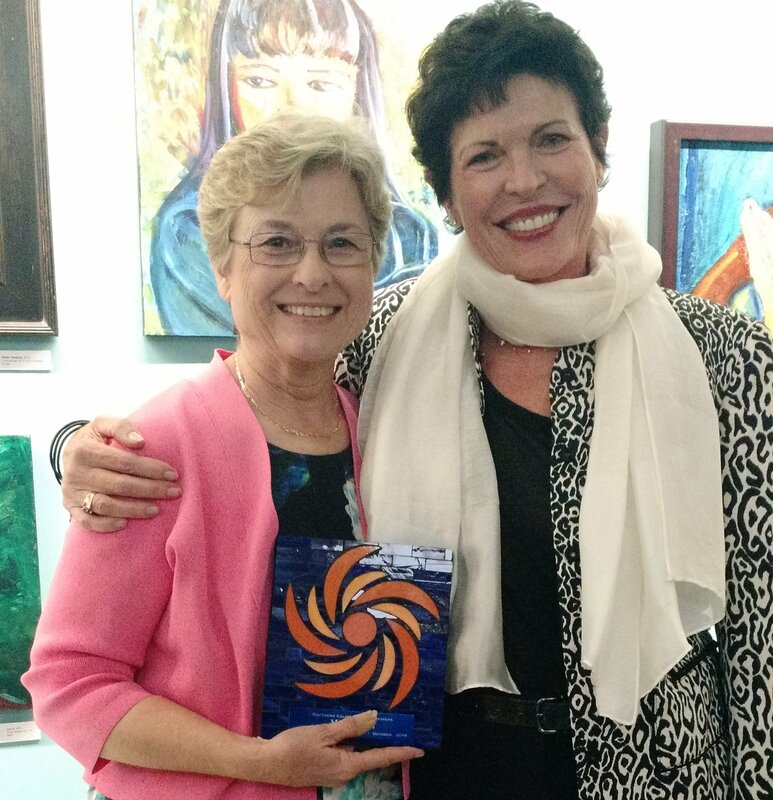 This month, SCG members, nonprofits, and other colleagues gathered to thank Mary Odell, recently retired President of the UniHealth Foundation, for her long and outstanding service to the Southern California philanthropic sector. Mary served for many years on our Board of Directors, in addition to volunteering her time each year to teach a professional development session on assessing proposals during our Fundamentals of Effective Grantmaking series. SCG Heart of Philanthropy Award Recipient Mary Odell with SCG President and CEO Chris Essel. At the reception, we were pleased to present SCG's Heart of Philanthropy Award to Mary in recognition of her decades of work supporting our communities. With this award, we are proud to honor Mary for strengthening our sector with her extraordinary leadership and compassion. On a personal note, Mary has been an incredible source of support and guidance during my first few years at SCG, and I will always be grateful for her commitment to our funder community. Congratulations to the 60 SCG members who completed our signature program, Fundamentals of Effective Grantmaking! Every year, SCG presents this popular series for staff who are new to the field and for those wishing to sharpen their skills and knowledge. This interactive, three-day series introduces grantmaking staff to basic skills and procedures and provides opportunities to interact with leaders in our philanthropy community during a series of engaging sessions. After this year's Fundamentals series, participants shared that "the greatest value was the comprehensive overview of the systems, people, and processes," while others noted how much they appreciated "opportunities to meet some of the biggest figures in the Southern California philanthropy landscape." While we love to share updates on the growing scope of SCG's initiatives, we firmly believe that the core of our work remains in supporting a highly-skilled, well-informed, and deeply networked philanthropic community. Keystone courses like Fundamentals create the bedrock of trust and knowledge funders need to collaborate and take action at the highest levels of effectiveness. Many thanks to all of our presenters—the wisdom, experience, and insight that they share with participants helps to elevate the sector and positively impact the careers of up-and-coming leaders and other seasoned professionals. Earlier this year, NBC producers contacted SCG for recommendations on foundations to feature in their new Saturday morning program, Give. The series encourages philanthropic giving among young people and shines a light on small charities across the country that are making a major difference in the world. We were thrilled to watch The Lawrence Welk Family Foundation, a longtime SCG member organization, profiled last week! During the episode, Welk Foundation President Lisa Parker and several Junior Board Members provided funds and guidance on how to distribute gifts to two worthy nonprofits serving youth in the Los Angeles area. Additionally, The Eisner Foundation, which supports inter-generational solutions to social issues, will be highlighted in an episode of Give in the coming months. It will feature actress Camilla Belle and spotlight two local nonprofits whose work demonstrates what’s possible when multiple generations come together for mutual benefit. The SCG community applauds NBC for creating a program that encourages charitable giving among young people. We're also proud to have NBCUniversal as a corporate member of the SCG family, with the company's Senior Vice President of Legal & Government Affairs, Steven Nissen, serving on our Board of Directors. 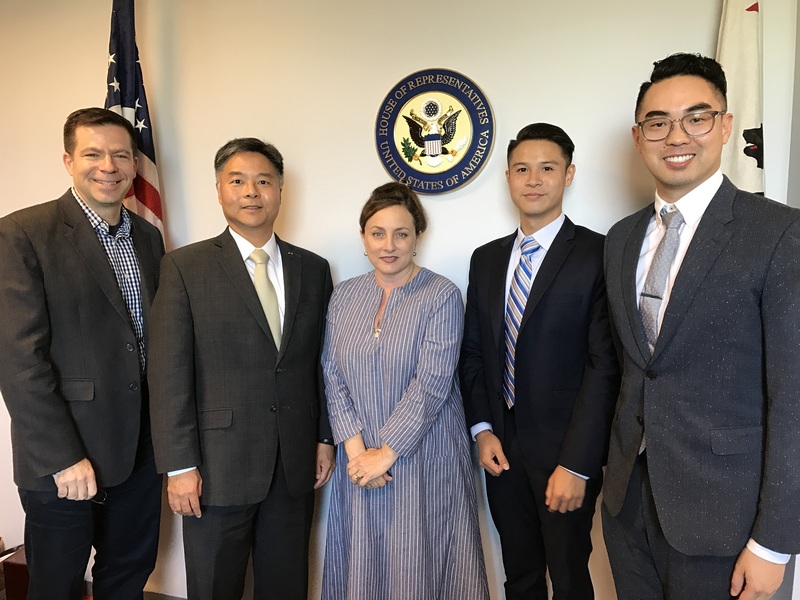 Earlier this month, SCG’s Public Policy Team, Call of Duty Endowment Executive Director Dan Goldenberg, and SCG Veterans Consultant Nancy Berglass met with Congressman Ted Lieu to discuss issues related to veterans, specifically veterans’ employment. Dan Goldenberg, Call of Duty Endowment; Congressman Ted Lieu; Nancy Berglass, Jimmy Tang, and Seyron Foo, SCG. We're pleased to share that our meeting resulted in an agreement to request an audit of federal veterans’ employment programs, which SCG is helping to support. Additionally, we will help identify opportunities for veterans to get better connected to nonprofit and government agency resources to aid their transition into civilian life. We also discussed ways in which the Bureau of Labor Statistics could improve measures of veterans’ economic well-being. United Way of Greater Los Angeles is asking you to put on your walking shoes and gather on November 19 at Grand Park for HomeWalk 2016, their annual 5K family run/walk to end homelessness in LA County. Through HomeWalk, United Way has helped house 17,000 of our homeless neighbors. However, there are still nearly 47,000 people suffering on our streets on any given night. SCG's staff and leadership are proud to personally support the efforts of our longtime member organization United Way, and we invite you to join us at this year's HomeWalk, either as part of Team SCG or with a team of your own! 1. Visit the registration site. 2. Under "participant type" select "walker." 3. Under "role" select "Join a Team" and search for "Team SCG." United Way’s core mission is to create pathways out of poverty for all Angelenos by eradicating homelessness. Online participant registration for HomeWalk will close on Friday, November 18 at noon. We hope to see you there! The complete set of videos and resources from our sold-out 2016 Annual Conference are now available.Stay tuned for more envelope-pushing events based on the bold ideas put forth at this conference!We look forward engaging our community in challenging yet inspiring conversations around equity and other crucial community issues through our work together over the coming year. Watch video clips of plenary sessions and keynotes (members only). Read a guest blog post by Daniel Heimpel of Fostering Media Connections. Experience the conference through social media on Storify. Access resources and presentations from conference sessions (members only). Visit our multimedia conference site for details on our incredible speakers and sessions. Read about key takeaways in my September Recap message. Funders joined a webinar presented by the Funders Alliance of San Bernardino & Riverside Counties on new data and funding models to support civic engagement in the Inland Empire. SCG and the LA Partnership for Early Childhood Investment held a session on opportunities for early childhood funders to support better health, development, and education outcomes. The SCG LA County Child Welfare Collaborative met with public, nonprofit, and philanthropic child welfare advocates to discuss Continuum of Care Reform and other issues. The Education Funders Group and SCG presented an overview of the higher education landscape and community college retention and transfer initiatives in Southern California. We're partnering with Grantmakers for Effective Organizations to bring you local examples of high-impact collaboration—join a workshop in Orange County (11/2) or Los Angeles (11/3). Join SCG and the LA Funders' Collaborative for an 11/16 briefing on harnessing new policies and public funds to create healthy and equitable communities in LA County. Just a few spaces are left for our day of service with The Eisner Foundation on 11/29 at L.A. Kitchen, where we'll tour their innovative facility and prepare food alongside their students. Save the Date! SCG members and their grantees are invited to the Red Cross Nonprofit Resiliency Academy: A Preparedness and Continuity of Operations Conference on 12/8. Thank you for your continued interest in SCG and your commitment to strengthening our diverse Southern California communities. And of course, Happy Halloween to you and yours!